First thing—invite everyone. It’s more fun with a crowd. Get out the tiki torches and string some lights in the backyard. Set up a few picnic tables and get a fire pit ready in case the evening gets chilly. Lots of folks spread newspaper on the picnic tables, and that’s fine. But if you’re a little bit finicky about such things like me, you might want to put tablecloths and butcher’s paper down, or get out the big, bright-colored bowls for serving. You can buy a lobster pot if you want to, but we use the turkey fryer. In any case, you’ll need a 30-32 quart pot, and it’s best if it has a strainer basket insert. This recipe makes enough for 18-20 people. Adjust accordingly. * This is near heresy where I’m from, you understand, but when I can get away with it, I use the large, pre-cooked, frozen, peeled, and deveined shrimp. I do this because I purely do not like over-cooked shrimp, and you can bet your mamma’s pearls there will be dissension over whether the shrimp is done or not. By the time everyone has finished squabbling, the shrimp will be over-cooked and therefore chewy. If you are a traditionalist, use fresh, unpeeled shrimp. But the minute they turn pink, for Heaven’s sake, get them out of the pot. Another reason I use the pre-cooked, peeled, and deveined shrimp is that I do not particularly enjoy peeling and deveining. Nor do I relish eating them un-deveined. But, to each his own. Step One: Put the water and beer in the pot. Add the onions, leeks, garlic, and lemons, and bring the mixture to a rolling boil. Add kosher salt and Old Bay and return to boil. Add the potatoes and Andouille and cook 20 minutes. Add the corn and cook 5 more minutes. Make sure potatoes are done. If necessary, cook a little longer. Step 4: Dump basket contents onto butcher paper or scoop into serving bowls. 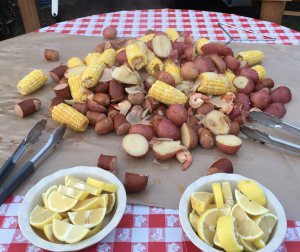 I like to serve Lowcountry Boil with lemon wedges, melted butter mixed with lemon, cocktail sauce, extra Old Bay, softened butter for the corn, and salt, and pepper on the side. You’ll need two rolls of paper towels per picnic table—this is messy, especially if you used unpeeled shrimp like most folks do. Of course you’ll need cold beer with this, even if you’re a wine lover like me. I throw in some crusty garlic bread, and of course, homemade key lime pie for dessert. Or, if the night is chilly and you do have that fire going, s’mores make a great dessert. If y’all try this, let me know how you like it!